Cantonese cuisine (廣東菜) is one of the most popular regional cuisines in Chinese cooking. Due to the large number of emigrants from Guangdong that went to the USA and other countries, when most people think of Chinese language or food they will often think of Cantonese language and cuisine. For example, in the UK 99% of the Chinese restaurants serve Cantonese cuisine and you can rarely find any different regional Chinese cuisine outside of London. 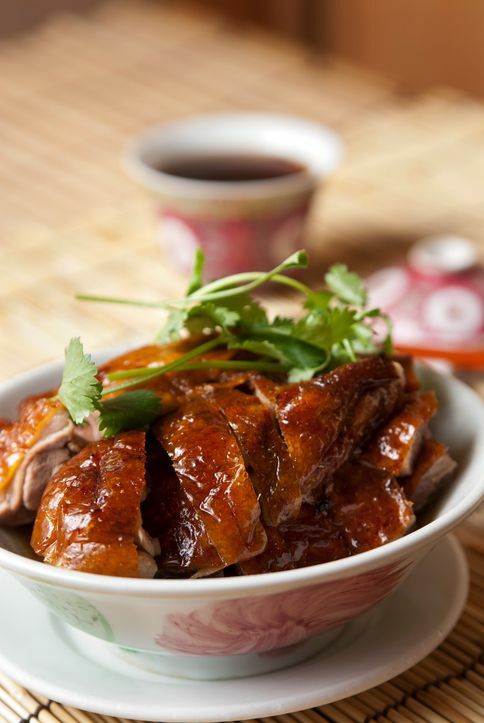 The most popular cooking methods in Cantonese cuisine are steaming, stir-frying and roasting. Dishes include different kinds of delicious dim sum, roast duck, chicken, pork belly and char siu pork, sweet and sour dishes and many more. These dishes are all stable dishes in Cantonese cuisine. I personally think Cantonese cuisine is sweeter and mellower than food from other regions of China and most Western people find it easier to accept the flavors of Cantonese cuisine. Below are some of the more popular Cantonese dishes and recipes around. This tasty pork dish can be used in stir-fry dishes, served with noodles, or used as a stuffing for pork buns. Food coloring gives it the red coloring common to barbequed pork purchased in Chinatown. Beef and bell peppers are cooked with a savory black bean sauce in this Cantonese home-cooked dish. Stir-fries are one of the most common and popular types of dishes in Chinese cuisine and beef with broccoli is one of the most popular stir-fry recipes. Not only can you find this dish in Chinese restaurants in the West but Chinese people also love this dish. A delicious and simple classic home-style Cantonese dish. This recipe can serve 3-4 people. Prepared black bean sauce takes the work out of rinsing and mashing fermented black beans in this quick and easy spareribs recipe. Serves 4 to 6 people. Char siu bao is a popular dish in Cantonese cuisine. The slightly sweet bun with delicious char siu pork filling makes it very popular. This recipe can make 24 steamed pork buns. These delicate spring rolls are filled with shredded pork, shrimp, shiitake mushrooms and garlic chives. Chinese dried shiitake mushroom adds an earthy flavor to this easy to make steamed chicken dish. This simple and delicious chicken stir-fry recipe is a perfect dish for a busy weeknight dinner. Delicious chicken wings marinade with oyster sauce and other ingredients. A great appetizer to treat your friends and family with. Made with chicken broth, this is a “thin” soup, you can thicken it by adding two lightly beaten eggs or two egg whites before serving. A delicious Cantonese style curried chicken recipe. Honey and garlic make an interesting flavor combination. This recipe for honey garlic spareribs serves 6-8 people. A different and delicious way to prepare lobster in Cantonese style. Fried chicken thighs are combined with pineapple and bell peppers in a sweet and sour sauce with pineapple juice, brown sugar, and vinegar. This recipe for sweet and sour pineapple chicken serves 3 to 4 people. You can use beef instead of pork in this recipe. Oyster sauce enhances the natural flavor of beef in this quick and easy beef stir-fry recipe. Serves 4 people. A hardy vegetable loaded with nutritional benefits, broccoli readily absorbs the Asian flavors in this easy stir-fry with fresh garlic and oyster sauce. The key to this recipe is to make sure the broccoli is thoroughly drained before stir-frying and to stir quickly so the garlic doesn’t burn. Almost everyone who likes “Chinese” food loves sweet and sour and this article will introduce you to two different versions of “Sweet and Sour Pork with Pineapple”. Chinese Turnip Cake is one of the most popular dishes in dim sum and is a must-have Chinese New Year dish. This article contains a step by step gallery to guide you through how to make beautiful and delicious prawn and scallop shumai.